Indian real estate is in a constant state of flux. The last few years have seen more change than ever before. The introduction of several government schemes and policies à la the Pradhan Mantri Awas Yojana, the Credit-Linked Subsidy Scheme (CLSS) scheme, the Real Estate Regulatory Act (RERA) and the recent Goods and Services Act, have had multiple influences on Indian realty. Earlier this month, the GST council approved a transition plan for a new tax structure. 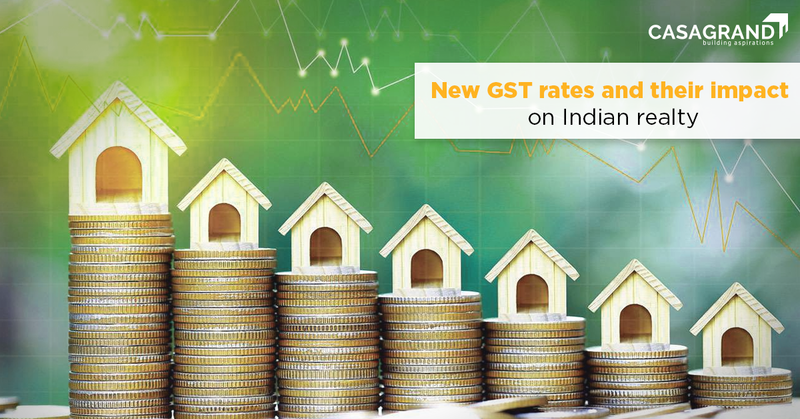 Let’s take a closer look at these new reforms and the impact of the new GST on real estate. The new transition rules now afford real estate developers the option to choose between old tax rates and new ones for residential projects that are still under construction. 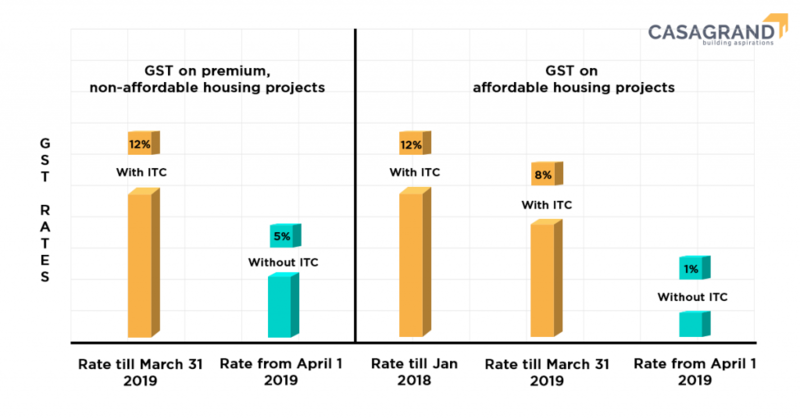 Additionally, this would mean that opting for the old rates would give them the benefit of input tax credit and the newer rates would come without the ITC benefit. Input tax credit is credit on the various materials used for the construction of a particular project. As per the new GST on real estate, the tax on under-construction properties has been reduced to 5% (without Input Tax Credit) from the previous 12%. The rates for the affordable housing segment will now be fixed at 1% (without input tax credit) from the earlier 8%. These rates will come into effect from 1st April 2019. Prior to the new GST on real estate, there were multiple computational and transitional issues revolving around pricing and loss of input credit. The move hopes to address these issues and smooth over potential disputes. Additionally, the new GST on real estate also clarified that going forward, projects with 15% commercial space will be considered as residential projects. This will be of extreme help to residential projects with multiple commercial amenities like restaurants and clubhouses. You can also read our blog on neighbourhood features that enhance your home’s value. The GST council has also imposed that 80% of input and input services must be purchased from only from registered dealers. This is mandatory if real estate developers wish to avail the benefits of the new GST rates on real estate. Real estate developers will have to bear in mind that failure to comply with these norms will result in having to pay tax at 18%. Tax on cement, however, can be purchased from an unregistered dealer but will attract a duty of 28%. While there are a number of changes for Indian realty and real estate developers themselves, the new reforms of GST on real estate show a few benefits for homebuyers as well. To help home buyers fully avail GST benefits, The GST council also opted to expand the definition of affordable housing. As per this, units with a carpet area of up to 60 sq.m in metro cities will be termed “affordable housing”. For non-metros, the carpet area goes up to 90 sq.m. For both metro and non-metro cities the effective GST rate on such units is capped at 1%, and the cost is capped at Rs. 45 lakh. The GST council hopes that the new reforms continue to boost demand in the affordable housing sector. While buyers who have already purchased existing projects may not fully feel the benefits of the new GST on real estate, potential homebuyers looking to purchase or invest in real estate definitely will, with these new reforms coming into effect on April 1st. Read our blog on must follow tips for first time homebuyers for more information! The new GST on real estate comes with a number of reforms but also with benefits to boot! This is a clear indication that the best time to buy a home or invest in real is right now. For world-class properties across luxury and affordable housing segments, head over to Casagrand today!